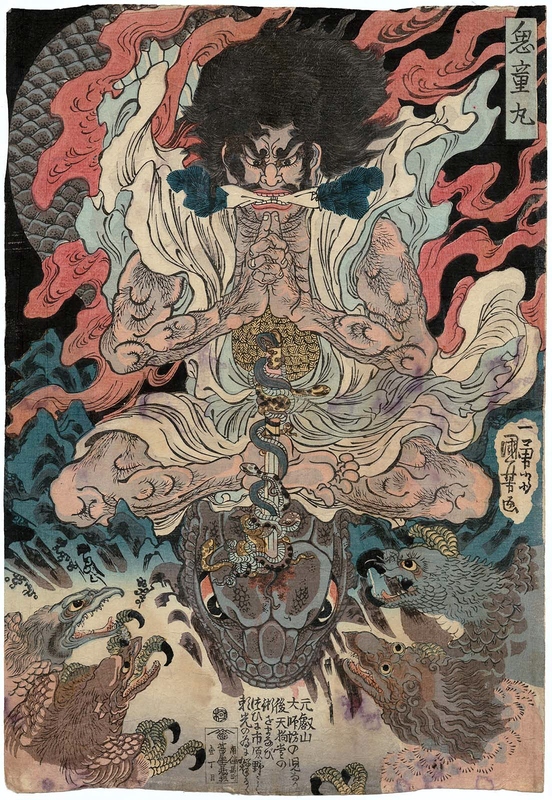 David Bowie’s longstanding fascination with Japan pervaded his work, becoming the gateway through which many of his fans began to explore that country’s cultural traditions and aesthetics. Perhaps the entry point is designer Kansai Yamamoto’s Ziggy Stardust togs, Yukio Mishima’s 1963 novel The Sailor Who Fell from Grace from the Sea—one of Bowie’s top 100 books—or the 1000s of images photographer Masayoshi Sukita captured of the rocker over a period of four decades. Maybe it was Aladdin Sane’s kabuki-like makeup or director Nagisa Oshima's World War II drama, Merry Christmas Mr. Lawrence, in which Bowie played a British officer in a Japanese POW camp. 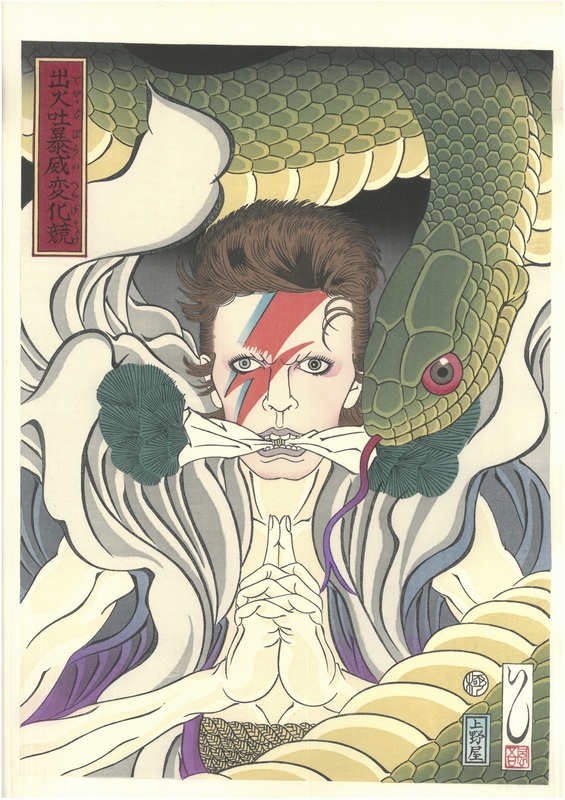 For each print, artist Masumi Ishikawa casts Bowie as both himself and an iconic Japanese figure. 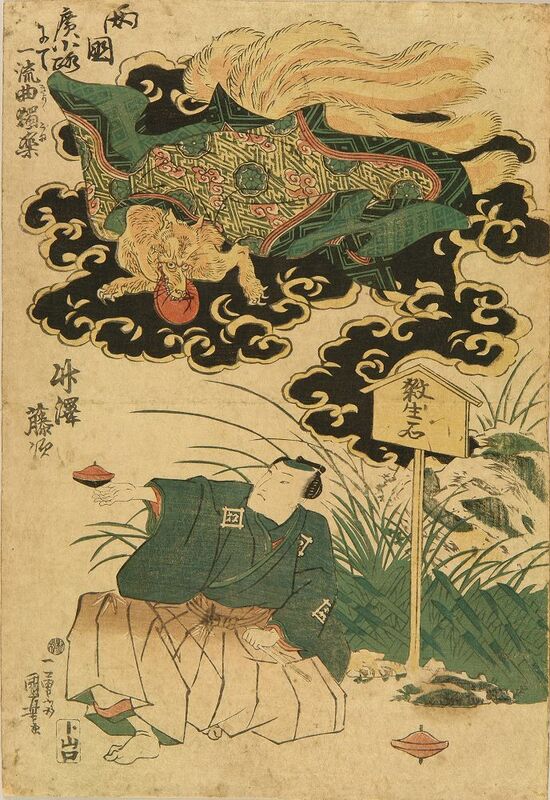 In the image at the top of the page, Bowie’s Aladdin Sane assumes the pose of the central character in Edo Period artist Utagawa Kuniyoshi’s Kidômaru and the Tengu, below. 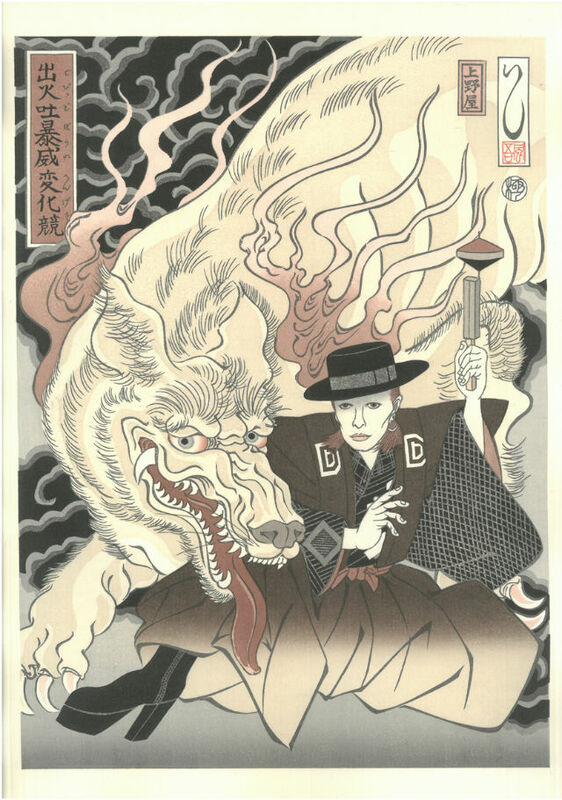 The other print relocates the dashing Bowie from Terry O’Neill’s Diamond Dogs publicity photos to the realm of magician Takezawa Toji, whose spinning top performances had the power to summon dragons, at least as depicted by Kuniyoshi. The prints and the blocks from which the impressions were made will be on display at BOOKMARC in Tokyo’s Omotesando neighborhood from June 23 to July 1. Ayun Halliday is an author, illustrator, theater maker, Chief Primatologist of the East Village Inky zine and Bowie fan. Her solo show Nurse!, in which one of Shakespeare’s best loved female characters hits the lecture circuit to set the record straight opens June 12 at The Tank in New York City. Follow her @AyunHalliday. Any word on if these will be for sale to the general public or not?